1969-1971 C3 CORVETTE INSTRUMENT CLUSTER CENTER GAUGE BEZEL - WITH WARNING LENS AND PUSH BUTTON. DIE CAST REPRODUCTION, AS ORIGINAL. EC320 BUTTON, SPRING AND CLIP. EC319 SEAT BELT LENS-INSTRUMENT CLUSTER BEZEL, DIE CAST ZINC AS ORIGINAL, WITH LENS AND BUTTON. NOTE: ORDER E2256 IF YOU WISH TO ORDER JUST THE BEZEL. FITS: 1969, 1970, 1971 CORVETTES. 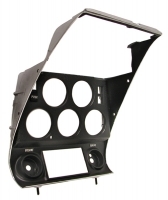 Log In To See Pricing 1968-1971 CORVETTE INSTRUMENT CLUSTER CONVERSION KIT. INCLUDES: MODIFICATION BEZEL, SEAT BELT BUTTON, SPRING & CLIP. Log In To See Pricing 1968-1971 CORVETTE RADIO WITH PLASTIC GAUGE BEZEL - WITH USB & AUX PORT (NO CD PLAYER). MILLENIA SERIES. 160 WATTS. Log In To See Pricing 1968-71 CORVETTE "FASTEN SEAT BELTS" WARNING LENS. Log In To See Pricing 1968-1971 CORVETTE SEAT BELT BUTTON, SPRING AND CLIP ASSEMBLY.